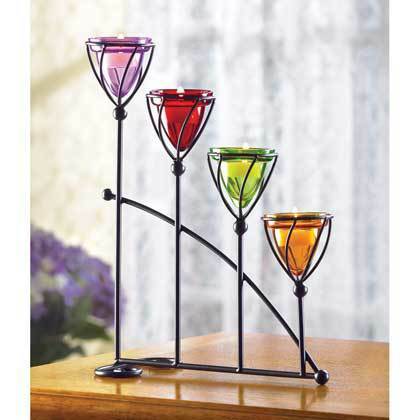 38648 Jewel-Toned Candleholder home decor, jewelry, decor, decorations, electronics, fountains, floor mats, art glass, vases, garden essentials, fireplace screens. A quartet of cone-shaped cups in sumptuous amber, amethyst, emerald and ruby shades casts a hypnotic halo of colored candlelight! The stylish stair-step wrought iron holder cradles each votive in a cage of graceful curves for a breathtaking display. Metal with glass cups. 11" x 4 5/8" x 12 3/4" high. Candles not included.